Do I need a whole lot of electrical tools? No. To build you own iguana cages properly you will need some basic tools, such as a drill and, ideally, a jig saw or PVC cutting tool. “How to Build Iguana Cages” tells you ways of making iguana cages without having the power saws, but it is better. Obviously, the more tools you do have the easier the construction of your snake or reptile cage will be but there are very few requirements for these iguana cages. If you do not have power tools, you'll find tips to help you make the cages without having all of the equipment. Not a lot. Mostly a desire to learn how to build a iguana house or cage. There are tons of pictures and tips throughout “How to Build Enclosures for Reptiles” that show you how to do everything you need to do to make a successful reptile enclosure. Keith's plans have never had a complaint and you can always invite a friend! What if I've never built anything before? We all had to start somewhere. With all of the advice, tips and tricks in “How to Build Enclosures for Reptiles” you can successfully build an iguana or chameleon cage. The booklet is full of pictures detailing exactly what you need to do to build a successful iguana house habitat or enclosure. Not a problem. We tell you how big to make the Jumbo Jungle Gym. These iguana enclosures have been created to suit all sizes of iguanas. Why not have two - an indoor iguana cage and and outdoor iguana cage for those sunny days! How big will the cage be? 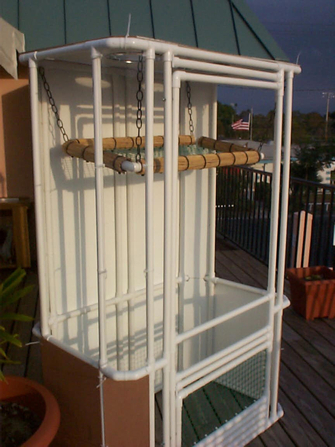 Fantastic starter cage or cage for those smaller spaces or iguanas. Great indoor iguana cage or outoor cage for those sunny days. Got a larger Iguana that wants a little more room? Why not have one of these outside? Very comfortable for any Iguana. 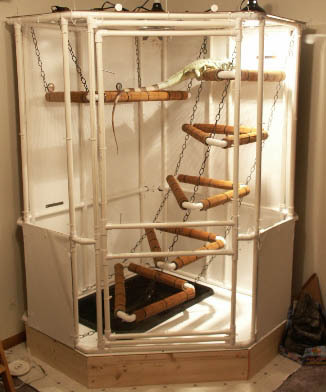 The Deluxe cage - your lizard can move about and be part of the family. An awesome cage that will be a real showpiece. Imagine what some decorations and foliage will make this look like. They are high enough to walk into and the Jumbo size allows you move around quite freely. Can I change the iguana cage plans? Of course. The plans are a guide only. There is information on building these cages to help you get started on making one of any size. we do suggest however that you start with one of the preset sizes so you have an understanding of what is involved. we would not advise making your own size first off if you are not very confidetn with building iguana enclosures. Are the iguana cages lockable? Ideally, reptile cages should be lockable.The iguana cages in “How to Build an Iguana Cage” are lockable and we show you simple and effective ways to do this. Of course you can make other ways to lock your igunana cage. How heavy will the igunana enclosures be? “How to Build an Iguana Cage” creates iguana cages that are especially lightweight. The construction methods and years of design work ensure their strength and durability. They are suitable for both indoor and outdoor use. There are a range of material you can use for different parts of the iguana cage but all of these are lightwieght and allow the cages to be easily moved if required. Obviously using heavy materials for floors will increase the wieght of the cages but these can be made to be easily removed and inserted after the cage is moved. What should I make it out of? The iguana enclosure frame structures are made from PVC piping.The coverings are a range of mesh products, clear paneling, lightweight white panel boards or other materials. These are used in different parts of the cages for different purposes. Many of the most inventive cages are made from a range of materials, all combined to give it an interesting and appealing appearance. What sort of animal are the cages suitable for? The cages are designed for large lizards such as iguanas but are suitable for arboreal lizards species such as chameleons and can also be used for other animals such as sugar gliders. They would also suit a large arboreal snakes such as a burmese python. You would have to ensure that the gaps are small enough to prevent escape but this is not a difficult task.